Your media player may require various codecs to play various media file types i.e. flac, mkv file extensions. There are many free codecs packages available. A web search for codecs will display various packages. If you are planning on installing codecs always choose the package, which is suitable for your Windows system. The settings for Burning and Ripping CD's can be found/alter via Windows Media Players Burning and Ripping settings section. MAIN MENU BAR :- Settings button :- Clicking will display the settings for the software. As below :- Media tab :- The settings refer to the media player Tab. Autoplay :- If ticked the player will automatically play media. Default Musiclist :- allows for the selection of the default playlist to be displayed in the program/media player Fill PlayNow with Default MusicList :- the selected playlist will be added to the playnow list view. Auto Hide Control Menu :- auto hides the media control menu at the bottom of the player. On mouse click play the file :- automatically plays the selected media file via single mouse click in the system disk tree view. On mouse double click play the file :- automatically plays the selected media file via double mouse click in the system disk treeview. Auto add file to Playnow on click :- on mouse click of a media file in the system disk treeview the file will be added to the playnow listview. Always on Top :- the program will always be in the fore ground i.e. on top of every other program. 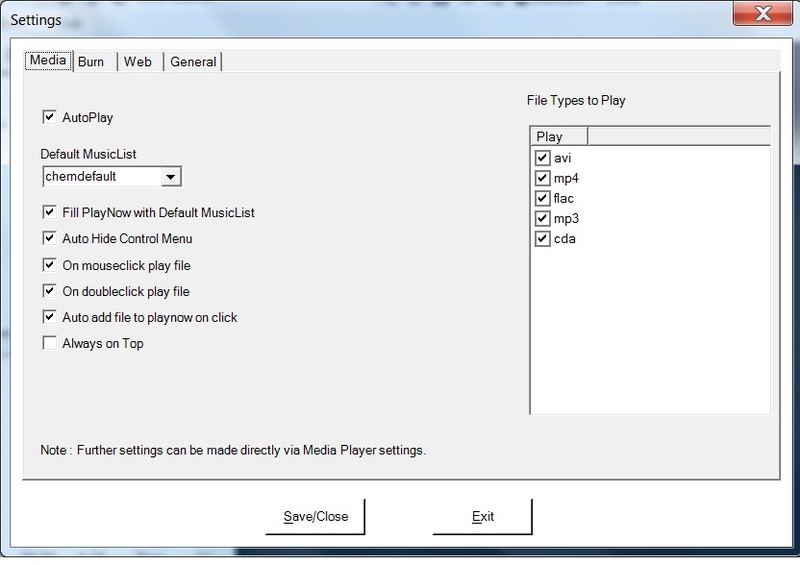 File types to play :-displays all the file type extensions the player can play. Untick any file types the user doesn't want to be player via the player. The player may require extra codecs to be installed on the computer to be able to play certain types of file extensions. Your media player may require various codecs to play various media file types i.e. flac, mkv file extensions. There are many free codecs packages available. A web search for codecs will display various packages. If you are planning on installing codecs always choose the package, which is suitable for your Windows system. Burn/ Ripping Tab :- Settings refer to the burn/rip tabs. 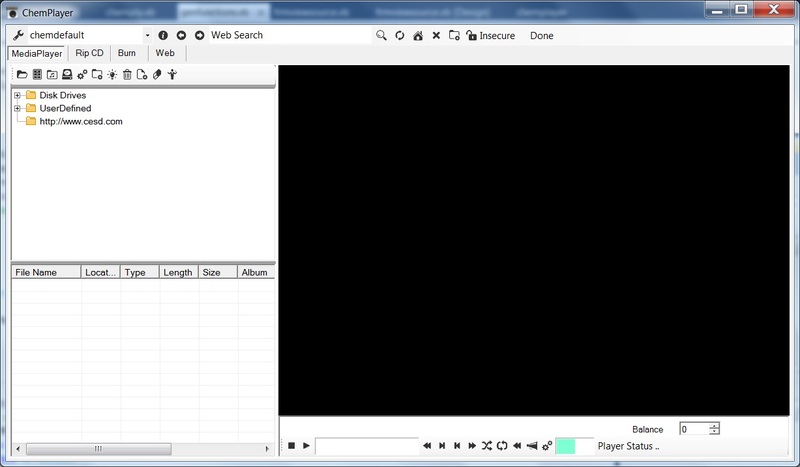 The player uses the settings of Windows Media Player. You can change settings via Windows Media Player Burn Settings. This also applies to the CDRom Ripping section. Web Tab :- The settings refer to a Web Page Tab. Further settings can be made via Windows Internet Explorer property settings. Suppress Scripting Errors :- ignores web page errors without displaying a message to the user. Drag from searchbox :- enables the text in the search textbox to be drag onto the treeview area to create a new node. 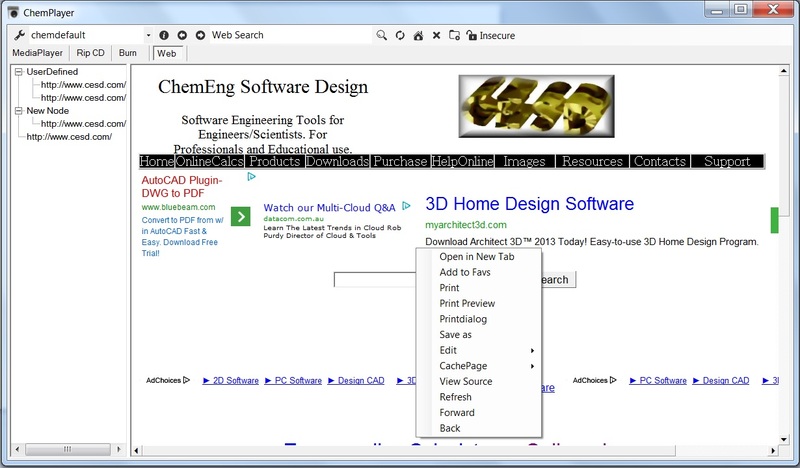 Use the default shortcut menu :- enables the use of the default shortcut menu for the web browser instead of the Chemplayer menu. View Tree Node on Double Click :- on double mouse click of a treeview node item, the item will be displayed in the web browser page. Startup web page :- on a new web page the initial default page will be what is entered in the startup webpage textbox. Page Fetching :- allows how the webpage will be accessed from the server. Recent vist webpages :- visited pages are saved under recent visit section in the treeview. You can specify how many to be saved/displayed. General Tab :- allows Font/Colour changes to the general program. Font :- the current settings will be displayed. To change the settings clcik the Font button and alter the font settings from the displayed possible listings. Click the Default Font to return to the default font sizes etc. Display Views :- Enables the colour of the selected option to be change. Select the required option, then click the Select Colour button to display the possible colour options. The default Colour button changes the colours to the default settings. 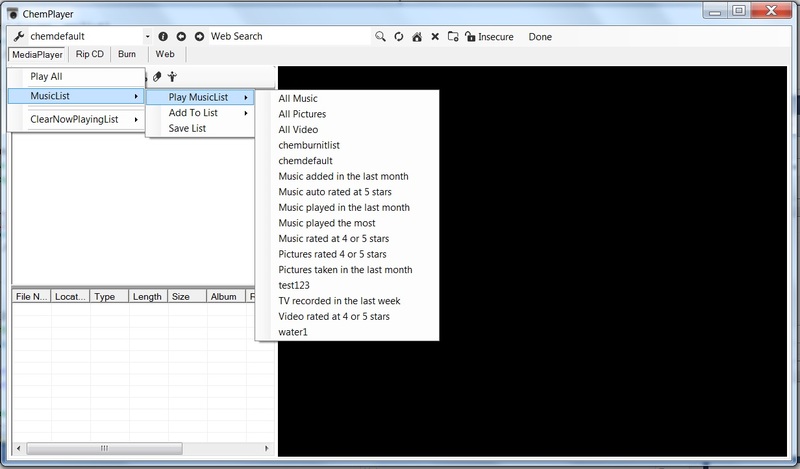 Playlist dropdown list box :- Displays the media player playlists on the computer. The list will default to the last played Playlist. By selecting a list, all the playlist media contents will be displayed in the "Play Now" List view. ChemPlayer does create it's own playlist "chemdefault" for playing the contents of the "Play Now" list view and "chemburn" contains the contents of files, which have been burned to a CD/DVD Rom. Displays information about the program. Add a new web browsing tab. Newly added web pages can be closed by clicking on the "x" in the right corner of the web tab title. Go Back:- Will display any previously visted website on the selected Web Page tab. Go Forward :- Will cycle thruogh visted website on the selected Web Page tab. Refresh/reload the current web page Web Search :- Enter in a web address or words, click the enter key or search button and the web page/search will be displayed in the selected web tab. Stop a web page from being loaded. security of the web pages are displayed. i.e. a locked padlock is displayed when the page is secure and a also a security encrytion is displayed i.e. 128 bit An unlocked padlock means insecure web page. MediaPlayer Tab :- MediaPlayer Tab MenuStrip :- Displays a Open File dialogbox. 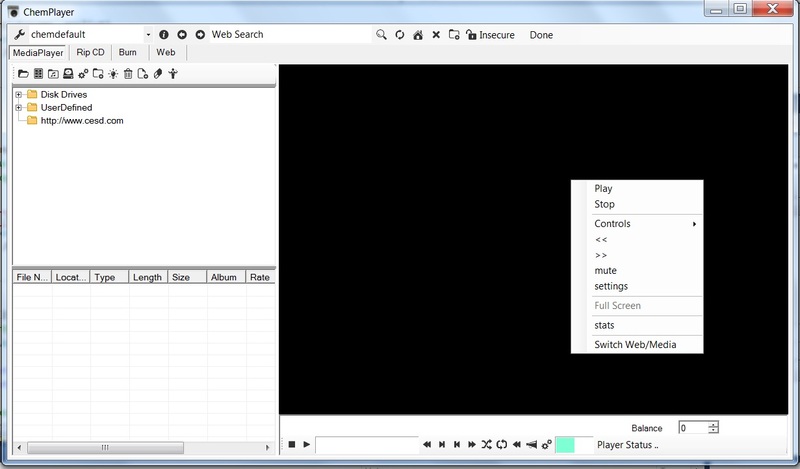 Enables to select a media file to be player. Starts Windows File Explorer. Enables direct dag and drop of files onto the disk treeview or the PlayNow listview. 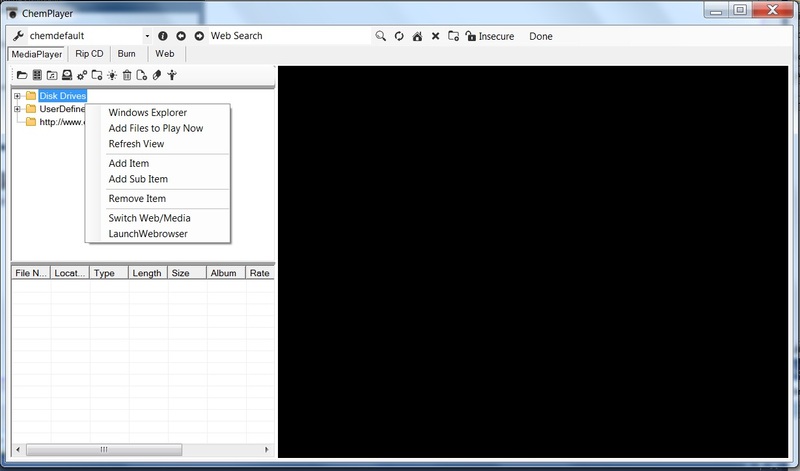 Enables switching between mediaplayer and web browser. Imports the CDrom contents to the PlayNow Listview. Opens the settings window explained about. Adds a new item into the disk treeview node. New nodes can be edited by mouse clicking on the new node and typing a value. Items are automatically saved. Refreshes the treeview and playnow list. Removes a selected node from the disk treeview list. Adds the selected item/node to the PlayNow List. Clears the PlayNow view listing. Displays a shortcut menu to the PlayNow View list. Options are :- Play All ~ Pays all the tracks in the PlayNow View list.Music List ~ provides options to play any created playlists, add selected items to playlists and also create new playlists. 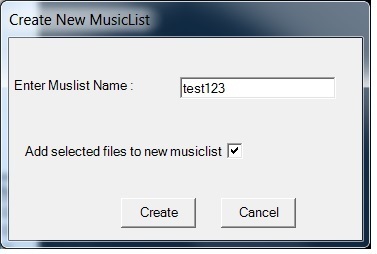 Save List ~ Alows for the creation of new playlists and also the addition of any files, directory of files items selected in the disk treeview to be added to the created playlist. Enter a name for the playlist, click the box to add any selected files, directories and click the create button to create the new playlist. Disk Files TreeView :- Disk tree view displays all the computer drives and allows the user to add user defined folders, file locations. Files can be individually dragged or whole directories can be dragged into the PlayNow list view. The user defined items can be edited. Settings can be changed via the settings dialog to automatically play files via mouse clicks etc. See Media Settings above. Selecting an item and then right mouse click displays the shortcut menu as seen above. Menu items :- Windows Explorer - launches Windows explorer. Files, directories can be directly dragged from explorer into the PlayNow list view.Add files to PlayNow - will add the files into the Play Now List View.Refresh View - refreshes the Disk Tree View.Add Item - Adds a new user defined item in the Disk Tree View.Add Sub Item - Adds a new user defined sub item to a selected main item.Remove Item - removes the selected user ddefined item.Switch Web/Media - switches media views between player and web browser.LaunchWebrowser - will display the selected node in the Web Browser.Play Now List View The Play Now List View displays the media files that will be played. A mouse right click will display the shortcut menu, as displayed above. Menu Options :- Play All ~ Pays all the tracks in the PlayNow View list.Play Selected ~ Plays the selected file.Music List ~ provides options to play any created playlists, add selected items to playlists and also create new playlists.Save List ~ Alows for the creation of new playlists and also the addition of any files, directory of files items selected in the disk treeview to be added to the created playlist. Enter a name for the playlist, click the box to add any selected files, directories and click the create button to create the new playlist.Remove Selected ~ will remove the selected item from the the Play Now View or PlaylistClearNowPlayingList ~ will clear the Play Now List View of all files.Stats ~ will display full details of the selected files.Media Player View The media player has normal play controls. Right mouse click will display the shortcut menu. Song title will be displayed, song progress(mouse click on progress bar to change the song position) forward, reverse, shuffle, repeat etc are all available controls. Fast forward moves rapidly forward thru the track being played. Click the Play button or Fast Forward button again to play the track and stop fast forwarding. Fast reverse moves rapidly revervse thru the track being played. Click the Play button or Fast Revervse button again to play the track and stop fast forwarding. Advance to next track in a playlist. Must be playing more than one track for this feature to work. Move to previous track in a playlist. Must be playing more than one track for this feature to work. 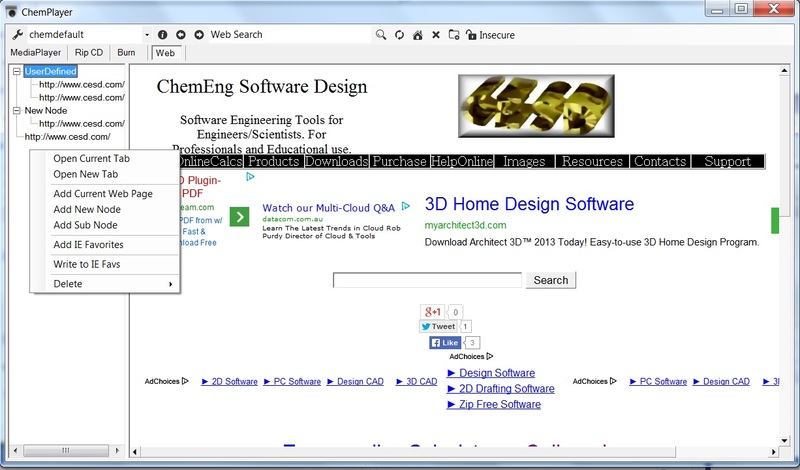 Web Browser Function To go to a web page/search the web enter text in the "web search" textbox, press the enter key or magnifying glass picture and the page search will be displayed in the focused web tab. Only on the default Web tab is a side tree available, which allows users to add in common visted pages, set up favorites etc. A right mouse click on this side display tree displays the shortcut menu above. Open Current Tab ~ this will display the selected item in the current web page.Open New Tab ~ will open a new browser and display the selected item.Add Current Web Page ~ Adds the current web page to the web tree view.Add New Node ~ adds a new item to the web tree view.Add Sub Node ~ adds a new sub item to a existing node.Add IE Favourites ~ add any existing IE book marks to the web tree view.Write to IE Favs ~ writes the selected node to IE Favorites, which will be visible in IE.Delete ~ deletes the selected nodes. Right mouse click on the web page will display the shortcut menu above. Open in New Tab ~ opens the link in a new web browser tab.Add to Favs ~ adds the link to the web tree view.Print ~ prints the page.Print preview ~ displays the page as it will be printed.Printdialog ~ displays the printer propertiesSave as ~ saves the web page to file.Edit ~ offers editing options.CachePage ~ provides options to reload the page from the server.Refresh ~ reloads the page.Forward, Back ~ if history is present allows to visit previously loaded pages.